Which is exactly where I went when a very kind somebody gave me a bag of at least 60 meyer lemons from their tree. I decided to get fancy and play at pretending I was Pierre Hermé. Although I have already made his honey lime truffles, this was my first attempt at a Pierre Hermé patisserie recipe, a tarte au citron, taken from the fabulous Cooks Book. Let me just say one thing. No, two things. Firstly,if Monsieur Hermé would ever like a lesson on how to rustify the look of his otherwise exquisite pastries, then I'm his girl. Secondly, if you ever substitute regular lemons with Meyers in a Tarte au Citron recipe, then cut back on the sugar because Meyer lemons are naturally much sweeter. Next time I am trying this with the same amount of sugar but using regular lemons instead. Other than being on the sweet side, this tart made with the best local ingredients was scrumptious. And here is another lemon Recipe. 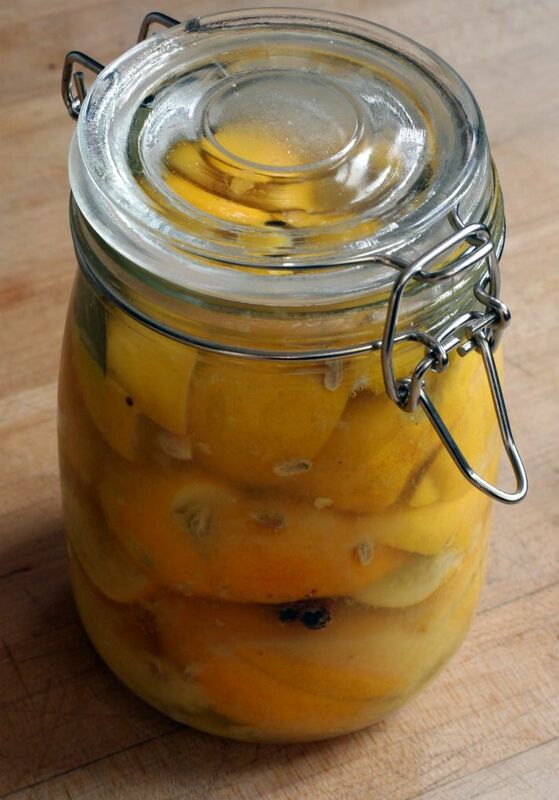 Preserved Meyer Lemons. Easy Peasy. 1 sterilized half litre jar. Put one tablespoon of the salt into the bottom of the jar. Cut crosses in the lemons to within the 1/2 inch of the bottom so that they are still joined as one. Sprinkle salt on the exposed flesh. Squoosh the lemons into the jar, packing down tightly as you go, adding the spices and more salt evenly between layers. If there is not enough juice expelled by the lemons, to cover them all sufficiently, then add more fresh lemon juice until they are all submerged. Leave a little airspace at the top and seal the jar. Leave the jar in a warm place for 30 days, shaking the jar each day to distribute the juices throughout the jar. To use the lemons, first rinse them and then remove the pulp. The lemons do not need to be refrigerated. Thanks to Jenn Knapp at Tante Marie's Cooking School for teaching me this recipe. PS. Thanks to Jill, fellow pupil in cooking class who took me seriously and remembered when I said if she gave me some of her lemon glut, I would promise to put them to good use. I was going to use the tarte au Citron as an excuse for not losing weight this week, but I surprised myself when I still managed to shed half a pound. No mean feat since the last seven days saw me indulging in 3 slices of it, more pate sucree scraps than you could count, a slice of pizza, French onion soup oozing with cheese, several glasses of wine and champagne, a middle eastern dinner with lots of dips and bread and other delicious things. Weightwatchers - I've got to love them, it really seems to work for me. Archive Alert! On this day in 2005: Funnily enough, I was mentioning Loulou's Garden at about this time last year too, after a trip to Berkeley Farmer's Market. beautiful cheesecake. my mouth is tingling with the idea of meyer lemons. so jealous you had so many that you could make the cheesecake AND the preserved lemons. I made a jar of preserved lemons last year with a bag of Meyers from a friend's tree. I've used them several times, and still have half a jar remaining. They are fabulous. My favorite way to use them is in a Moroccan chicken tagine with green olives. The tart is absolutely beautiful. I can think of nothing better than a lemon tart... well, a key lime tart maybe, but lemon is right up there. I love the mirror too! Lovely tart. I recently made a similar meyer lemon concoction from Suzanne Goin's new cookbook, Sunday Suppers, which includes a thin layer of chocolate under the lemon curd. It was divine! If you live in the bay area and have anywhere at all to put it, plant a meyer lemon tree - home despot has them for reasonable prices, they grow really easily. But it takes 3 to 4 years fot them to get over the planting shock and start to seriously produce. But when they do, it's meyer time baby! This is what you were making! Look at this yellow! Gorgeous and I am lemon tart fan! Ah le rugby story. 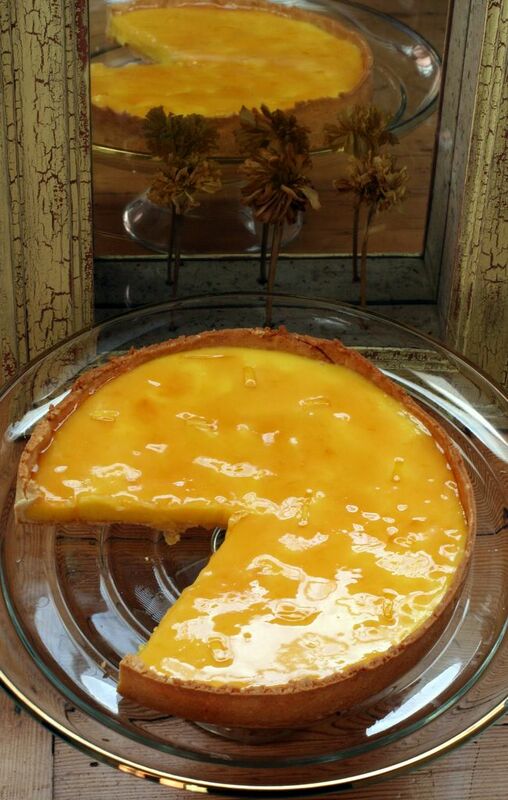 For once that the French win at something ;-) Vive la tarte au citron! Such an imbalance in the Meyer lemon world! Some people get a sack of 60; others get none. Some people get 300 (!!) from a neighbor's overhang; others buy mushy lemons from the farmers' market. However. Thanks, Owen, for the information about transplant shock. That may explain why we got eight beauties the first year and none the second. This year: Looks promising. Sam: Beauteous tart. And tart retort! Thanks for the preserved lemon recipe--it looks great. I have a Eureka lemon tree in my backyard that is full of lemons, and am always looking for new ways to use them. Last year I made Indian lemon pickles (Southern and Northern versions), and this year made limoncello (an Italian lemon liqueur which uses the lemon peel). Does anyone have any ideas about how to pick the ones at the top of the tree? Does a special picking tool exist? The tart looks divine Sam. Lovely photograph of it. id love to preserve some lemons but im afraid i never get around to do it, and soon enough they have passed their preservation time. Sam - Thanks for the preserved meyer recipe! I've been looking for one lately, been meaning to give preserving a shot. I must admit, I am a meyer lemon virgin. I've never had any (nor bought any). That tart just looks so purdy! I smell another food project coming up! PS. I just made ricotta cheese from your post. Oh, how easy easy it was!!! And, congrats on losing the weight...although with such beautiful tarts as that, I just don't know how you do it. You're a better woman than me (actually, I'm a guy, but you know what I mean). vanessa - it was luck, but i gave a slice of tart to someone work who then informed me he has a regular lemon tree so I think another bagful might beon its way. Jennifer - I can't wait to experiment with them. I think they will last a while. Maya - I bought the mirror about 8 years ago at Columbia Road FLower Market in London. I carried it over the atlantic in my luggage one time. del4yo - oops pardon! Un autre temps! Erin - chocolate, eh? now that sounds interesting. Owen - the reason I will be trying the recipe with rregular lemons next time is because that's my next free lemons offer! Living in rented accommodation with no garden is not really conducive to growing lemons. Bea - aw c'mon the french are always winning, world cup footie, 6 nations rugby, don't be modest! Marc - limoncella was on my list too, but having had the real mcCoy on the Amalfi coast I am not convinced I could do such a good job ad the Italians. saffron - it takes two ticks, seriously fast recipe. Definitely put aside half an hour for it! Gerald - goodluck! Elise has a recipe too on Simply Recipes in case you want to check out an alternative. Rose - I am pretty sure I saw your ricotta pop up in my rss reader earlier. I had never heard of Meyer lemons til I acame to California. Kevin - I am not sure either. Maybe it's all those toes I chopped off? Sam, I love his lemon tart and yours looks as good as his! I don't think I've seen meyer lemons around here, I'd love to try it one day. And the preserved lemons, they are really versatile, aren't they? Is it much milder when you make with meyers? I hope you're not getting too thin though, take care and say hello to Fred for me. Aaah Keiko - I've missed you!. Meyers are MUCH sweeter than regular lemons, the have none of that sharpness, they are quite different. I think they are crossed with a mandarin. All the time I was making this pastry I was thinking "How does Keiko get hers looking so perfect!" Ah, Sam, you are a blogger after my own heart. I would never have imagined it possible to combine two of my passions--Meyers lemons and rugby--into one post, but you have pulled it off. And you're a Wales fan to boot. Your tart looks beautiful. If only England had something like this to look forward to as a post match reward, I'm sure the outcome would have been different. Hmmm. I had regular organic lemons -- and made a fairly straightforward lemon jouce and salt preserved lemon as descried recently on my site. I like your recipe. Hmmm. Thanks. Just did it! Thank you for this wonderful recipe. Now I have to wait 3-4 weeks for the preserved lemons! Dear Sam, Gday to a fellow foodie. I love your blog!! If I could bow at your feeties right now I would. I know zip about bloggin and am tryin to figure out how to follow yours. I signed up for my own blog on dashboard and listed yours as one I want to follow but not sure I did it right. Would love to have some used for those preserved Meyers Lemons as I'm given a 100 or so every year. There's about 50 in the frig now. What do you use them for after you've preserved them> Are they mushy? Do you chop them up and use them in recipes? Do you lose all the juice when you put them up? SOrry to ask so many questions:-( I would email you if I could figure out how to do it. I'm married to a graphic artist who also is a potter, cartoonist, sign painter, etcetc. You name it he can pretty much do it.